It's pretty evident from the above clause that it's not in your best interest to play any progressive jackpot at this casino. As such it merits our Court Jester Badge clause 2 section (iii). *The badge will only be removed once the operator agrees to amend this term. Wicked Jackpots Casino offers a holistic approach when it comes to gambling online. The new frontiers of Cyber World infrastructure is mere computer software on a website. The tracking and flow of coins and cash has now become a charge on a credit card. Owned and operated by Cassava Enterprises Limited, the operator is licensed in both Gibraltar and the United Kingdom. We’re all familiar with the cliché that money cannot buy you happiness. But, I’m convinced that almost everybody has to learn that lesson the hard way because let’s face it; the idea of having enough money to throw at your problems until they’re solved is a seductive impulse. This little island country has great technological infrastructure. Favourable financial and business laws. Excellent credibility and reputation of the host-country’s government. And this is exactly where Wicked Jackpots Casino sets the standard. With its vibrant selection of instant-play table games, towering progressive jackpots, graphic-rich slots machines and live casino; gaming has never been this good. If you’re searching for a lucrative match bonus you’re in luck. New players are welcomed with a 7-stage match bonus up to £1,100 plus 130 free spins. 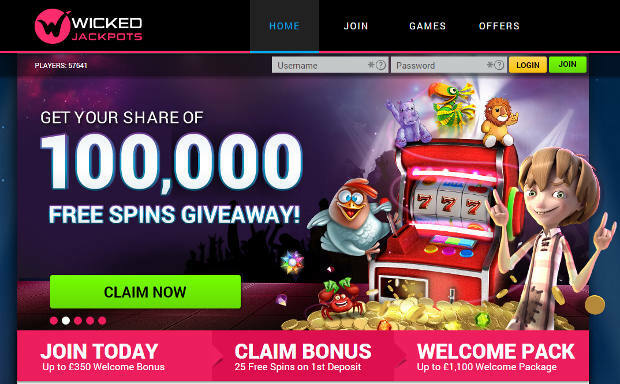 The first is a match bonus of 100% up to a maximum of £350 plus 25 free spins to play Rainbow Riches. If you do accept the bonus your initial deposit will be doubled immediately. The operator can be contacted 24/7 through live chat, toll free telephone numbers (for players who reside within the UK) or email. We even tested the site’s support by sending them an email to see how quickly the response was. Suffice it to say it was fast and they went above and beyond the call of duty. Not only are they professional but friendly too. Wicked Jackpots Casino gives you the opportunity to set your own deposit and session limits plus it grants you a ‘cooling’ off period. The self-exclusion option can be for a couple of weeks to 6 months to permanent. Or, if you have a serious gambling problem you can ask the operator to terminate your account. Rest assured that your private details remain under lock and key at all times. The casino uses sophisticated SSL (Secure Socket Layer) encryption software. In the best interest of fair gaming, the operator also states that it’s RNG (random number generator) is tested regularly for added transparency and safety. The average payout ratio for all the games is 96.5%. The online casino’s software is tested by eCOGRA. Are the WR (wagering restrictions) attached to the sign on bonus high? Yes. We’ve deducted a few points, if management reduces the play through we’ll increase it. Although the initial bonus offer is great, Jeremy Wilson co-owner of top portal casino, Casinolistings.com points the following out: ”Bonuses used to be genuine offers or incentives aimed at attracting customers and giving them a shot at winning. Now they are mostly traps designed to reel customers in and make sure they lose. This is due to the excessive restrictions attached to them such as high wagering requirements, low bet limits, and sometimes even caps on the amount you can win and withdraw. Not to mention fraudulent “spirit of the bonus” clauses that dodgy casinos use as a last resort to prevent paying players who won and followed all the other rules.” I’m not trying to dissuade you from accepting the bonus but to highlight the fact that it might not always be in your best interest if you accept it. Are progressive jackpots included in the withdrawal limit? Yes they are. Any progressive win will be paid out in installments over a period of 24 months. Is the daily/weekly/monthly withdrawal limit reasonable? No, it’s not. The maximum monthly withdrawal limit is £3,000. Large wins will be paid out in installments. As a result of the low withdrawal limit, we caution you not to play the cash you’ve won back into the casino. In summary. From an entertainment point of view, Wicked Jackpots Casino certainly hits all the high notes. I like the fact that it has an extensive game library, offers a 7-stage sign on bonus to new players, has a refer a friend program and fast payouts. The not so good. The bonus wagering is 80xb, very low monthly withdrawal limit and progressive jackpot wins are included in the withdrawal limit. Discretion is advised especially when playing progressive games and accepting the deposit bonus. Aside from the 7-tier welcome bonus package up to 1,100 credits to new players. Regular players receive 1 credit for every 1000 Bonus Chips. For every £2 wagered you’ll receive bonus chips. For every friend referred you will receive £10. The cash can be used to play slots only and cannot be converted into cash. You are not allowed to refer more than 15 friends per month. Terms and conditions apply. The Cash Back Bonus Scheme is divided into Blue, Bronze, Silver, Gold, and Platinum. Before you can qualify for the cash back you must stake at least £20. It works like this: If you’re a Silver player and you stake £200 and win £180, you’ll receive a bonus of £20. The casino returns 10% of the remaining £20. The maximum cash back bonus Blue players receive is £5. Bronze players £25, Silver players £75, Gold Players £100 and for Platinum players £150. *VIP players receive a minimum cash back bonus a VIP of £5. The following deposit and withdrawal are offered: Entropay, Maestro, MasterCard, Neteller, PayPal, Paysafe Card, Ukash, Visa, Visa Debit and Wire Transfer. The minimum deposit and withdrawal cash amount is 30 credits. Deposit can be made in British Pounds, Canadian dollars, Euros and American dollars. Before your withdrawal is processed you must provide a valid copy of the following documents: Your drivers license, or passport, a utility bill (water and electricity, insurance bill) or bank statement not older than three months. The game variety hosted by Wicked Jackpots Casino is simply of the charts. It’s divided into slots machines (majority) followed by table game variants like blackjack and roulette, 7-figure progressive games, live and mobile casino and video poker. The graphics and animations that feature in the 3D (3 and 5 reel varieties) slots could best be described as ‘eye-candy’. Each slots comes with its own set of bonus rounds, free spins, wilds, scatters, multiple paylines and coin denomination. You’ll also note that the deposit bonus is mainly slots centric, mainly because they’re high-variance games that favour the house predominantly. Slots that epitomize the above are the NetEnt games like Elements, Gonzo’s Quest, Aliens, Starburst and Jack Hammer 2. If you’re looking for something different other than the NetEnt games, the IGT games such as Cleopatra, Excalibur, Bruce Lee and Rainbow Riches are the pick of the crop. With a fully responsive mobile interface, you can now play all your favourite casino games from your mobile device (Androids, Tablets and iPhones). Due to the quality of the graphics, the games may stall or even appear a little ‘jittery’ at times. At this stage 8 progressive games can be played. The only game that offers a substantial jackpot is Millionaire Genie. At the time of writing the total jackpot stood at £1,533,000 and counting.